The Egyptians also elevated some human beings to gods. Their leaders, called pharaohs, were believed to be gods in human form. They had absolute power over their subjects. After pharaohs died, huge stone pyramids were built as their tombs. Pharaohs were buried in chambers within the pyramids. Because the people of Egypt believed that their pharaohs were gods, they entrusted their rulers with many responsibilities. Protection was at the top of the list. The pharaoh directed the army in case of a foreign threat or an internal conflict. All laws were enacted at the discretion of the pharaoh. Each farmer paid taxes in the form of grain, which were stored in the pharaoh's warehouses. This grain was used to feed the people in the event of a famine. 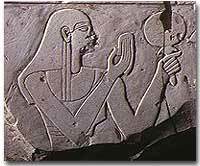 Ancient Egyptian royalty, nobility, and clergy enjoyed lives of wealth and comfort while farmers and slaves struggled to subsist. No single person could manage all these duties without assistance. The pharaoh appointed a chief minister called a vizier as a supervisor. The vizier ensured that taxes were collected. Working with the vizier were scribes who kept government records. These high-level employees had mastered a rare skill in ancient Egypt — they could read and write. Right below the pharaoh in status were powerful nobles and priests. Only nobles could hold government posts; in these positions they profited from tributes paid to the pharaoh. Priests were responsible for pleasing the gods. Religion was a central theme in ancient Egyptian culture and each town had its own deity. Initially, these deities were animals; later, they took on human appearances and behaviors. 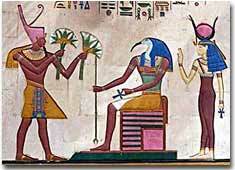 Seated here is Thoth, the god of learning and wisdom, carrying a scepter symbolizing magical power. Nobles enjoyed great status and also grew wealthy from donations to the gods. All Egyptians — from pharaohs to farmers — gave gifts to the gods. Soldiers fought in wars or quelled domestic uprisings. During long periods of peace, soldiers also supervised the peasants, farmers, and slaves who were involved in building such structures as pyramids and palaces. Skilled workers such as physicians and craftspersons made up the middle class. Craftspersons made and sold jewelry, pottery, papyrus products, tools, and other useful things. Naturally, there were people needed to buy goods from artisans and traders. These were the merchants and storekeepers who sold these goods to the public. At the bottom of the social structure were slaves and farmers. 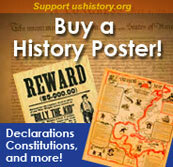 Slavery became the fate of those captured as prisoners of war. In addition to being forced to work on building projects, slaves toiled at the discretion of the pharaoh or nobles. Farmers tended the fields, raised animals, kept canals and reservoirs in good order, worked in the stone quarries, and built the royal monuments. Farmers paid taxes that could be as much as 60 percent of their yearly harvest — that's a lot of hay! Social mobility was not impossible. A small number of peasants and farmers moved up the economic ladder. Families saved money to send their sons to village schools to learn trades. These schools were run by priests or by artisans. Boys who learned to read and write could become scribes, then go on to gain employment in the government. It was possible for a boy born on a farm to work his way up into the higher ranks of the government. Bureaucracy proved lucrative. The pharaoh was at the very top of ancient Egyptian society, and servants and slaves were at the bottom. Who was in the middle? Click on this interactive pyramid to find out how merchants, artists, farmers, and others stacked up. Links at the bottom of the page lead to other facts about ancient Egypt. This page comes from Odyssey Online, a website for kids produced by Emory University. How do archaeologists identify artifacts? Play the Find the Pharaoh's Fragment game to find out. Senet was ancient Egypt's most popular board game during the New Kingdom. How was the game played? What do the symbols mean? The Israel Museum in Jerusalem offers an explanation of the game along with a picture of a 3,300-year-old gameboard and pieces in its collection. In ancient Egypt, a person's job determined his or her status. Because Egyptian culture emphasized religion and medicine, doctors and priests enjoyed more privileges than merchants, scribes, or craftspersons. And tomb builders — who created some of the greatest wonders on Earth — lived lives of constant toil in crowded villages. This high school student's illustrated, online project explores Egyptian social classes. The images at this website illustrate that even though two families go through a nearly identical day, there are many differences between the worlds of a nobleman and a farmer. Survey the images etched in a nobleman's tomb and click each picture to learn more about everyday objects. Explore all three sections of this visually rich website on Egyptian life: "Story," "Explore," and "Challenge." One of the most extraordinary collections of Egyptian art on the planet is housed at the Metropolitan Museum of Art in New York City — and online at their comprehensive and appealing website. Click on links throughout the text to see statuary, jewelry, or portrait sculpture, or click on "Explore & Learn More" to read more about Egyptian art and history. Social classes existed long before there were pharaohs, kings, and viziers. Egyptians were each born into a social class determined by their parents. Explore the social classes of Egypt, from the well-to-do carpenter to the lowly peasant, while reading quotes from the famous vizier Ptahhotep on the Egyptian class system.